Peachtree Publishing Company, 9781561450916, 32pp. Sunrise Elementary School has a BIG problem. Their new librarian, Miss Lotta Scales, is a real dragon. When Sunrise Elementary School advertised for a thick-skinned librarian with a burning love of books, Miss Lotta Scales knew she was perfect for the job. Who could guard books better than a REAL dragon? But when she won't let any of the children take a book from the shelves, the teachers form a delegation. Not even sweet Miss Lemon can convince Miss Lotta Scales that "the library belongs to the children. "Fortunately, when nearsighted Molly Brickmeyer stumbles onto a copy of Snuff the Magic Dragon and reads the tale out loud, her storytelling beckons the children back to the library and brings them face to face with the Library Dragon. Can an open book temper the flames of the school's hotheaded librarian? 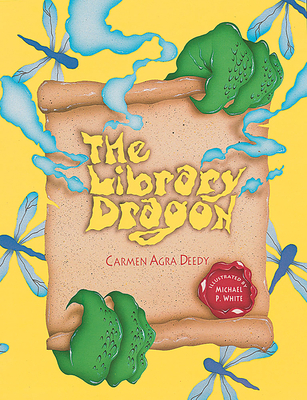 This humorous tale by New York Times best-selling author - Carmen Agra Deedy - is paired with Michael P. White's lively illustrations for an entertaining story about the power and importance of books for both children and adults.